American sailors have come to the rescue of distressed Iranian mariners for the second time in less than a week, the Pentagon said Tuesday. The United States Coast Guard cutter Monomoy "picked up six Iranian mariners after their vessel broke down" in the Persian Gulf Tuesday, the BBC reported. At about 3 a.m. local time, the Coast Guard vessel "was hailed by flares and flashlights from the Iranian cargo dhow, Ya-Hussayn," the U.S. Navy Central Command/Fifth Fleet public affairs report said. The Iranian mariners asked for assistance from the Monomoy because the cargo dhow's engine room was flooding. "Monomoy immediately launched their small boat and approached the Ya-Hussayn," the Pentagon report said. "Two persons were rescued from the vessel, and four from a life raft tied off to the dhow's stern." The six Iranian mariners were taken aboard the Coast Guard ship and given water, blankets and halal meals, the Pentagon said. One Iranian mariner received medical treatment for minor burns. The Coast Guard then turned the six mariners over to an Iranian Coast Guard vessel at approximately 4:30 p.m. local time, the Pentagon said. The Captain of the Iranian Coast Guard vessel, the Naji 7, speaking through a translator, thanked the Monomoy captain and crew "for assisting and taking care of the Iranian sailors," the Pentagon said. The latest American rescue comes just five days after a U.S. Navy ship belonging to U.S.S. 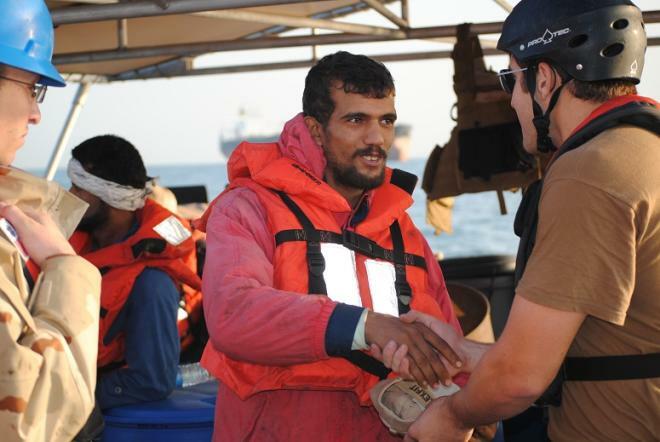 John C. Stennis aircraft carrier strike group freed 13 Iranian fishermen from Somali pirates in the Arabian sea. The American sailors gave clothes, food and water to the freed Iranian fishermen, who had been held hostage by their Somali captors for six weeks. "It is like you were sent by God," one of the freed Iranian fisherman, Fazel ur Rehman, told the American sailors, the New York Times' C.J. Chivers reported. Iran's foreign ministry on Saturday praised that Navy rescue effort, calling it "a humanitarian gesture."